Anderson is a city in and the county seat of Anderson County, South Carolina, United States. The population was 26,686 at the 2010 census, and the city was the center of an urbanized area of 75,702. It is one of the principal cities in the Greenville-Mauldin-Anderson Metropolitan Statistical Area, contiguous with Anderson County, which had a population of 187,126 at the 2010 census. It is further included in the larger Greenville-Spartanburg-Anderson, South Carolina Combined Statistical Area, with a total population of 1,266,995, at the 2010 census. Anderson is just off Interstate 85 and is 120 miles (190 km) from Atlanta and 140 miles (230 km) from Charlotte. Anderson is the smallest of the three primary cities that makes up the Upstate region and is nicknamed "The Electric City" and "The Friendliest City in South Carolina". 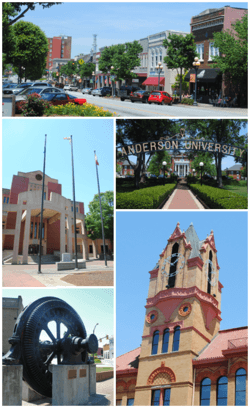 Anderson's spirit and quality of life have earned national recognition as Anderson County was named an "All-America City" in 2000. Anderson is the home of Anderson University, a selective private comprehensive university of approximately 3,400 undergraduate and graduate students. Cherokee first settled the area of what is today the city of Anderson. During the American Revolution the Cherokee sided with the British. After the American Revolutionary War the Cherokee surrendered their land. In 1791 the South Carolina legislature created the Washington District which comprised Greenville, Anderson, Oconee and Pickens counties. The Washington District was then divided into Greenville and Pendleton districts. Anderson, Pickens and Oconee comprised the newly created Pendleton district. 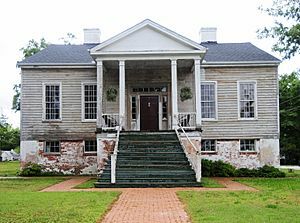 Anderson was settled in 1826 and incorporated in 1828 as Anderson Court House separating from the Pendleton district. The name Anderson is in honor of Robert Anderson who fought in the American Revolutionary War and also explored the Anderson region in the mid-17th century. Anderson County was also established in 1826 out of the Pendleton district. In 1851 the Johnson Female Seminary was established in Anderson as the first college of the town and was named after William Bullein Johnson. One year later the seminary was renamed Johnson University. During the American Civil War Johnson University was closed and converted into a Confederate treasury. On May 1, 1865 Union forces invaded Anderson looking for the Confederate treasury. The treasury office of Anderson was ransacked by Union forces and the main building of Johnson University was used as a Union headquarters. A minor skirmish erupted at the Battle of Anderson leading to two Union casualties. 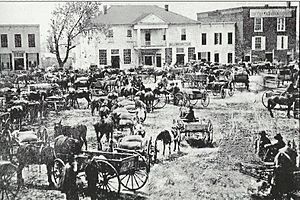 After the war a Union garrison was stationed in Anderson. Portman Shoals Power Plant around 1920. Anderson became one of the first cities in the Southeastern United States to have electricity. Electricity to Anderson was established by William C. Whitner in 1895 at a hydroelectric plant on the Rocky River giving the city the name "The Electric City." Anderson also became the first city in the world to supply a cotton gin by electricity. In 1895 Anderson Court House was renamed to Anderson. In 1897 Whitner's plant was upgraded with a 10,000 volt generating station at Portman Shoals. 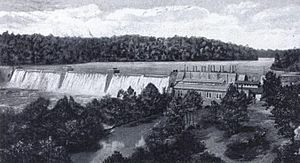 Whitner's power plant at Portman Shoals became the first hydroelectric plant to generate high voltage without step-up transformers in the United States. The Portman Dam was swept away in 1901 forcing Anderson to be in darkness until it was rebuilt in 1902. In 1911 Anderson College was established by the Anderson Chamber of Commerce. Anderson College was a successor to the Johnson Female Seminary and is affiliated with the South Carolina Baptist Convention in particular the First Baptist Church of Anderson. Anderson College became a co-ed two year junior college in 1930 and in 2006 it became Anderson University. 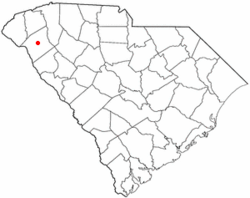 Anderson is located in the northwest corner of South Carolina on the Piedmont plateau. Anderson is a 1-hour drive from the Blue Ridge Mountains and a 4-hour drive from the South Carolina coast. Anderson lies roughly at the midpoint of the busy I-85 corridor between Atlanta, Georgia, and Charlotte, North Carolina. The Caldwell-Johnson-Morris Cottage, built around 1851. Anderson Memorial Stadium — A ballfield/stadium on 12 acres (4.9 ha) of land on White Road. Renovated in 2007 with stadium-style seating. Home to the Anderson University Trojans. Anderson Sports and Entertainment Center — A 300-acre (120 ha) area that includes the Anderson Civic Center, a 37,000 square feet (3,400 m2) facility, as well as one of South Carolina's largest amphitheaters that can accommodate 15,000 people, a huge castle-like play structure with play equipment, a 64-acre (26 ha) sports center with 7 baseball/softball fields, 3 soccer fields, disc golf course, and 8 tennis courts. There is also a lake with park, picnic shelters, and miles of nature trail. The ASCE is Anderson's largest recreational area. Anderson is served by Anderson County Regional Airport (IATA: AND, ICAO: KAND). The airport is 3 miles (4.8 km) away from Anderson and has 2 runways; runway 5/23 is 6,000 feet (1,800 m) and runway 17/35 is 5,000 feet (1,500 m). The airport also has helipads. The airport has no control tower but is able to accommodate regional jet aircraft. In addition, the airport has a small terminal. Anderson has five signed exits on I-85, currently the city's only freeway. Several notable highways pass through the city, including U.S. Route 76 and U.S. Route 178 co-signed along Clemson Boulevard, also known as SC-Bus 28, and U.S. Route 29 leading to Hartwell, Georgia, to the south and Greenville to the north. In 2011, construction began on a new east-west connector which is approximately three miles long between Clemson Boulevard and South Carolina Highway 81. On August 16, 2010, the connector was voted to have four lanes with turn and bike lanes with a completion date set in October 2012. On November, 8th, 2013, the East-West Parkway formally opened to traffic. Anderson has four bus routes (Blue, Green, Red, and Gold) that travel to most major areas of the city, running every hour. and also receives service from Clemson Area Transit (CATS) via the 4U route. The city uses both newer hybrid buses and older style trolleys resembling Anderson's old streetcars. Inter-city bus travel is available through Greyhound Lines, located on West Whitner Street near downtown. Though the city still doesn't have as extensive a transit system as more modern cities, it is making plans to expand its ventures. The city is currently trying to acquire a full-time office space for a downtown bus transfer center. There is also the potential for growth in the future, including a new line connecting Belton to Anderson. At the census of 2000, there were 25,514 people, 10,641 households, and 6,299 families residing in the city. The population density was 1,843.7 people per square mile (711.8/km²). There were 12,068 housing units at an average density of 872.1 per square mile (336.7/km²). The racial makeup of the city was 63.12% White, 34.01% African American, 0.22% Native American, 0.78% Asian American, 0.04% Pacific Islander, 0.68% from other races, and 1.16% from two or more races. Hispanic or Latino of any race were 1.48% of the population. In the city, the population was spread out with 22.2% under the age of 18, 10.7% from 18 to 24, 26.3% from 25 to 44, 20.4% from 45 to 64, and 20.4% who were 65 years of age or older. The median age was 38 years. For every 100 females there were 82.3 males. For every 100 females age 18 and over there were 77.5 males. Anderson, South Carolina Facts for Kids. Kiddle Encyclopedia.